What is a Surgery Center? Ambulatory Surgical Centers (ASC) are facilities where surgeries that do not require an overnight stay are performed. Grand Avenue Surgical Center provides a safe, cost-effective, and compassionate environment. Patients find our surgical center to be less stressful than a large hospital environment. We are able to provide each patient with more time, attention and care than a hospital setting. Why should my procedure be performed in a surgery center versus a hospital? A large majority of all surgical procedures can and should be performed in an outpatient setting versus a hospital. Because we are state licensed, we are held to the same standards as a hospital. Unlike a hospital, however, a surgery center specializes in same-day surgery, and, as such, its staff is specialized in providing patient care for outpatient surgical procedures. Further, patients admitted to a surgery center are healthy and will not be exposed to patients with critical illnesses as would be the case in a hospital setting. 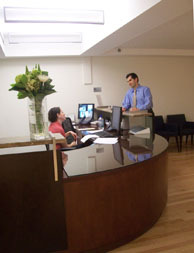 The length of your stay depends on the procedure that is performed. The average stay at our facility is 2 to 3 hours for most visits. Does insurance pay for outpatient surgery centers? Yes. Grand Avenue Surgical Center welcomes all insurance carriers. Physicians who are granted privileges at the Center refer eligible patients for surgeries. On the day of surgery, the patient arrives at the Center, has the operation and a few hours later, safely leaves for home. Copyright © 2008 Grand Avenue Surgical Center. All rights reserved.